A combination of qualification and experience creates the element essential for the performance of advanced construction projects: confidence. 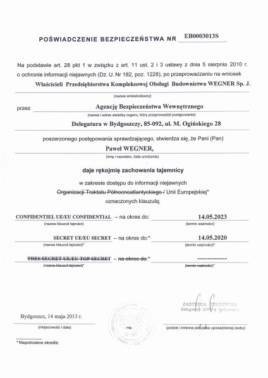 At PKOB Wegner, this confidence means a guarantee of successful completion of the project. Our over 25 years of experience is a guarantee that for every project and in every case we find the best solution. Decades of work on different construction sites are just one of the reasons that have made PKOB WEGNER one of the regional leaders in the industry. Over-the-top engagement and hard work have led the company’s impressive growth, with an unchanging goal – customer satisfaction. Highly qualified specialists of PKOB WEGNER know how important close cooperation with clients is. The foundation of our company are people. Their many years of experience and care for the highest quality of services is the source of our success. By cooperating with our company, you gain the support of the best specialists in the industry; experts holding know-how earned over many years of education and work. 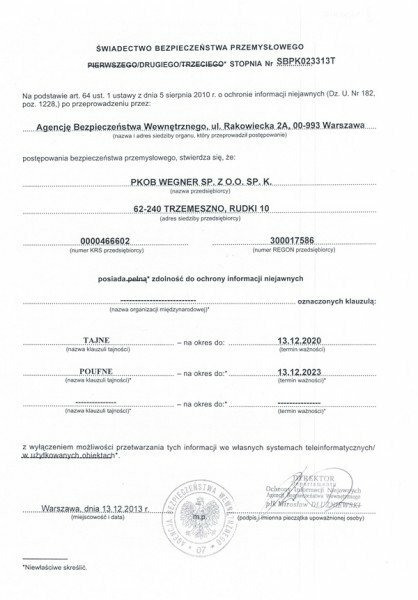 What is important: know-how confirmed by the numerous references, whuch they have received for their multi-million investments. Everyday professional practice has taught the engineers of PKOB WEGNER to overcome challenges emerged from the unforeseen situations and… systematically track the industry-leading innovations, so that their competence is updated on an ongoing basis. Professional approach to each project and constantly expanding knowledge are our ultimate values. Thanks to them, we become the answer to all the questions and doubts of our Clients – by choosing to cooperate with us, you gain access to comprehensive service, proven solutions and cooperation with people for whom work is their individual passion, but success – always joint. We specialize in general contracting of public, commercial, warehouse, manufacturing, office and industrial buildings. We start with a construction and executive design, and we end up with commissioning the building to use in the turnkey condition. On request, we provide the investment with equipment and furniture; working in this field only with manufacturers and suppliers who guarantee proven materials and solutions. Furthermore; we have our own machine park, which significantly accelerates the time of investment. 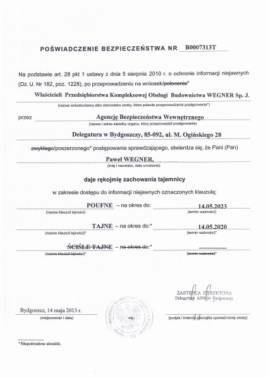 Apart from many years of professionalisation, the second characteristic of PKOB WEGNER is also of great importance: our company is 100% Polish capital. 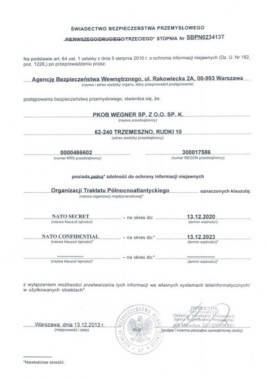 Thanks to this, we have 100% responsibility for each of our project; at both financial and image level. These two elements combine in unquestionable quality; we take care of the highest effectiveness of our projects. Thanks to this, we have been extending our offer over the years, to provide a complete construction investment service today. And thanks to this, our company enjoys unwavering trust, which is confirmed by several hundred completed investments throughout the country. 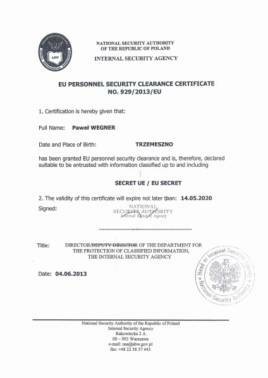 Few companies have the industry security certificate of second degree to the CONFIDENTIAL clause. 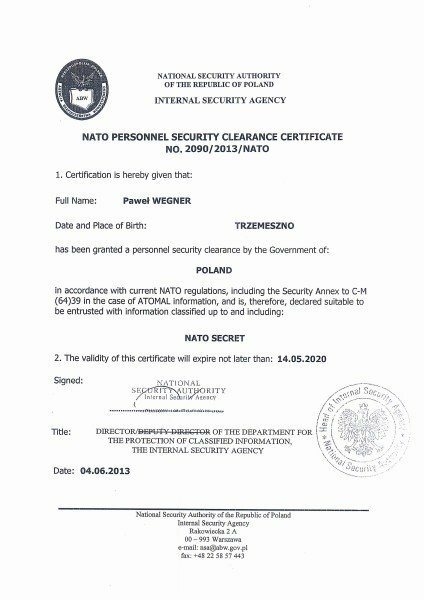 Few companies have in their management staff people holding the security certificate at the level of access to classified information from the international exchange of the NATO and the European Union. 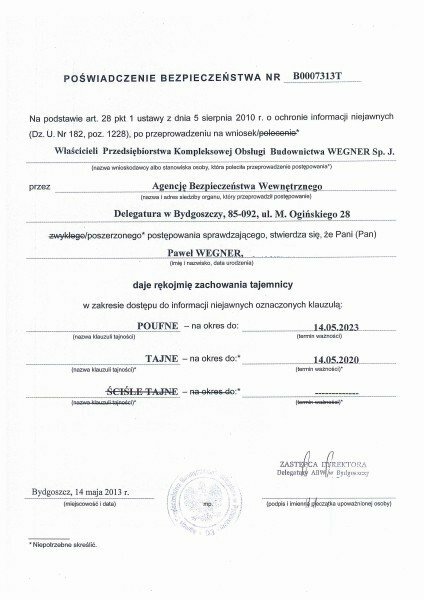 PKOB WEGNER has both, which seems to us to best complement our professionalism. 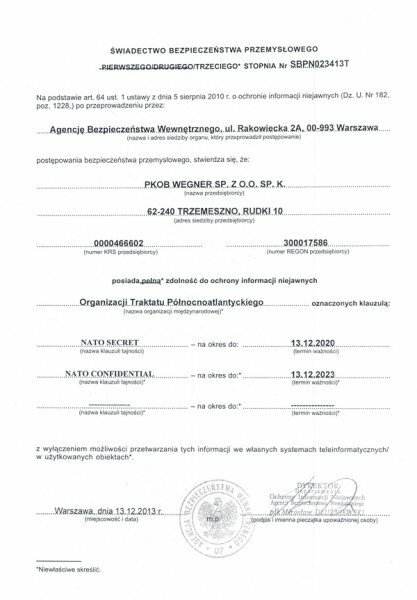 There is a special division of protection of classified information in accordance with the Act on protection of classified information of 05.08.2010r. (D.U.L. 182, item 1228) organized in the company. The organizational structure of the company also has a division with a plenipotentiary for the protection of classified information and secret office. 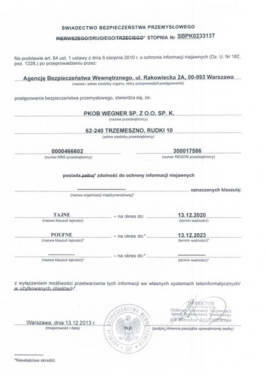 The company has a certificate of SECOND SECURITY. 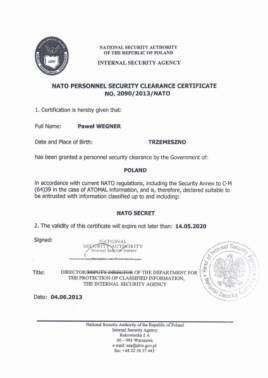 The Management of the company also has a personal security clearance with access to classified information derived from the international exchange of NATO and the European Union. 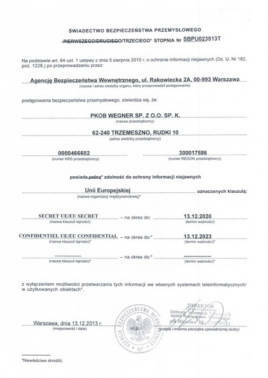 Hospital in Puszczykowo named of Prof. S. T. Dąbrowski S.A.